This article is a step by step breakdown on how to add a discount or charge to the system. Do note that you can only make modifications when the reservation status is in “Rental” or “Open”. There are several places where you can manually add a discount or a charge. For discount, it is in Step 3 (Extras) or Step 6 (Payments). For charges, it is in Step 6 (Payments) or Step 8 (Contract). In Step 3 (Extras), there is a discount section located at the bottom of the page. Here, enter the amount of the discount that you would be giving highlighted in orange in the picture below or select a discount coupon. Do note that the discount given here will only be on top of the daily rate and not overall price. Once you have entered the amount or selected the discount coupon, click on the blue “Update Order” button. 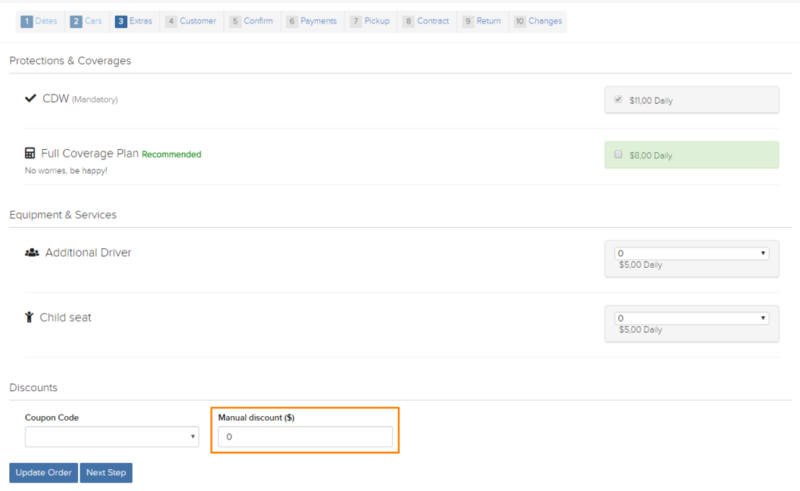 In Step 6 (Payments), click on the blue “Add Discount” button highlighted in orange in the picture below. Once you have clicked on the button, a new window will appear. Here, enter the amount of the discount or select the discount coupon that you have created. Next, click on the blue “Save” button highlighted in orange in the picture below. Do note that the discount given here will only be on top of the daily rate and not overall price. How to remove a discount? In Step 3 (Extras), if the discount is a coupon discount, you will notice a checkbox highlighted in orange in the picture below. Uncheck the box and click on the blue “Update Order” button. If the discount is a manual discount, remove the amount in the “Manual Discount” field and click on the blue “Update Order” button. In Step 6 (Payments), you will see a “Delete” icon on the right side highlighted in orange in the picture below. Click on the icon and a window will appear asking for confirmation that you would like to delete the discount. Click on the blue “Ok” button to delete the discount. 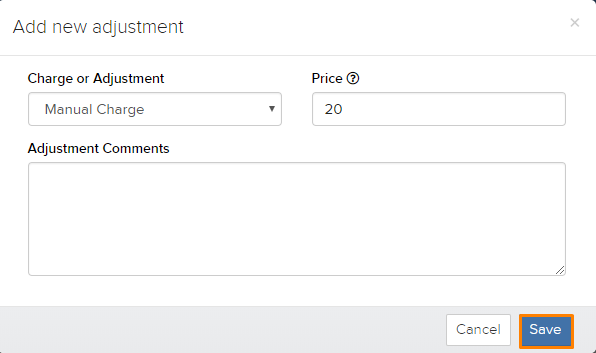 In Step 6 (Payments), click on the white “Add Charge or Adjustment” button located under the discount section highlighted in orange in the picture below. Once you have clicked on the button, a new window will appear. Here, select the charge that you have created and enter the amount under the “Price” field. If you leave the “Price” field empty, the system will automatically take the default amount that you put when you first created the charge. Click on the blue “Save” button highlighted in orange in the picture below to save the charge. In Step 8 (Contract), under the “Contract Modification” section, click on the blue “Charge or Adjustment” button highlighted in orange in the picture below. Once you have clicked the button, a new window will appear. Here, Here, select the charge that you have created and enter the amount under the “Price” field. If you leave the “Price” field empty, the system will automatically take the default amount that you put when you first created the charge. Click on the blue “Save” button highlighted in orange in the picture below to save the charge. How to remove a charge? In both Step 6 (Payments) or Step 8 (Contract), click on the charge that you would like to delete as shown in the picture below. Once you have done so, a new window will appear. Click on the red “Delete” button. A confirmation dialog will appear after you have clicked on the “Delete” button. Click on the blue “Ok” button to confirm the deletion. For more information about how to create a discount coupon, click on this link here. To learn how to create an additional charge, click on this link here.